Las Vegas is Sin City but it is also Fun City. The glitz, the lights, the gambling, the desert, the parties, all come together in this desert city to provide visitors with the time of their lives. Las Vegas means The Meadows in English. The city earned it's name because of the artesian wells that supported the development of meadows and greenery in the area before the growth of the city over the last two centuries. Nevada was once part of Mexico until the United States annexed the territory but there are still strong hispanic influences in the State. Visit Las Vegas, let loose and enjoy America's fabulous desert playground! Las Vegas Boulevard is where it all happens! 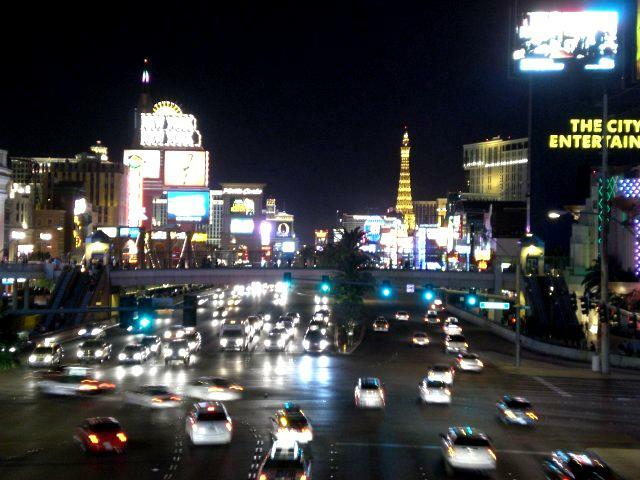 The Strip is the main drag with all the famous casinos you've heard of. The Tropicana, the Luxor, New York New York, the Bellagio, Caesar's Palace, the Mirage and The MGM Grand are a few of the best hotels in Las Vegas. There are also a few good bars and restaurants along the Strip to be visited and the ever-present souvenir shops feature strongly as well. The casinos try and provide the most attractive entertainment to maximise their visitor numbers. This heavy competition for each visitors' attention makes it all the more exciting with more fun things to see and do than is humanly possible in a short period of time in Sin City. Attractions and activities in the casinos include the obvious such as gambling, restaurants and pools to the more diverse musicals, plays, magic shows, showgirl extravaganzas or massive music stars. There are also technology orientated activities like 3D movies, interactive and virtual reality media and video games. More culturally inclined options are also available to visitors with excellent traveling museums and art exhibitions in various casinos. The Strip at night is a show in itself. It is an incredible show of lights, cars and people trying to make the most of their time in fabulous Las Vegas! 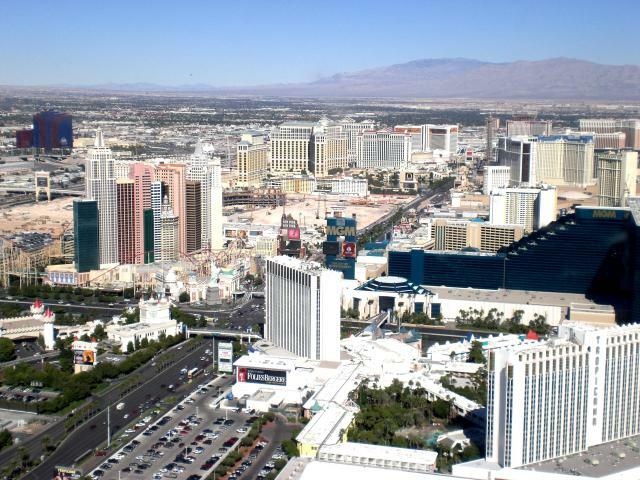 During the day the Strip is a hub of activity with the sidewalks jam-packed with people going from souvenir shop to souvenir shop, casino to casino, attraction to attraction and just checking others out as they walk by. The Grand Canyon is one of the World's Natural wonders and understandably, one the top tourist destinations in the world. 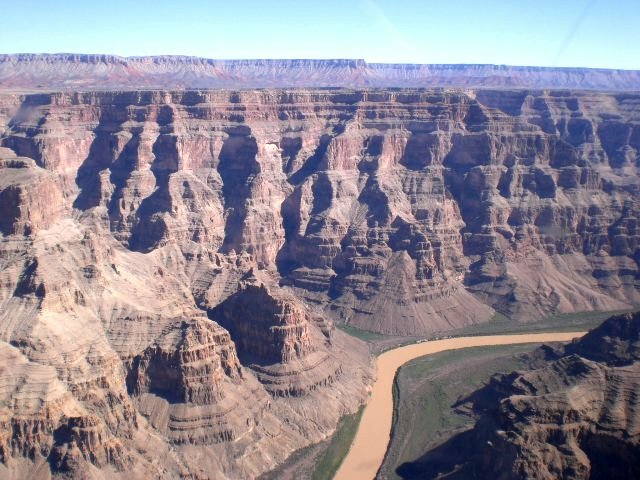 The canyon itself is 1 mile or 1.6 kms deep and 277 miles or 443 kms long. The floor of the canyon is graced with the flowing Colorado River which carved the Canyon out of the earth's surface over the course of time. It really is amazing. The Canyon has two rims, the North and South rims. The South Rim is open year-round but the North Rim is closed from Mid-October to Mid-May each year due to heavy snow and dangerous conditions for visitors. Visiting the two different rims will take a significant amount of time as you must drive around one end of the Canyon to get to the other rim. From Las Vegas, the Canyon is about a five hour drive and 45 minute helicopter flip. The Hoover Dam was built during the Great Depression of the 1930s and is one of the greatest engineering feats ever to be undertaken worldwide. 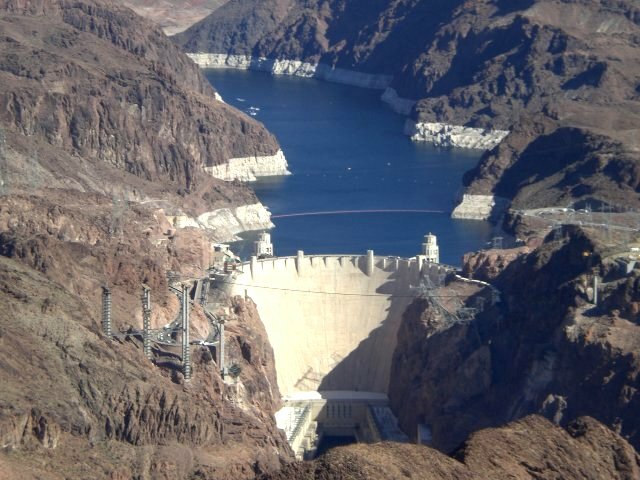 At a height of 54 stories and regulating the flow of the Colorado river, the dam created the large artificial Lake Mead. The dam is about 35 miles or 56 kms outside of Las Vegas and offers guided tours educating visitors about the dam's purpose and it's electricity generating capacity. The impressive Lake Mead is a man-made lake just outside of Las Vegas and is the largest artificial body of water in the United States. The Lake exists because of the Hoover Dam regulating the flow of the Colorado river. It is a huge playground and holiday destination for both locals and foreigners alike. Water skiing, fishing, swimming, boating and jet skiing are just a few of the activities holiday makers can enjoy on Lake Mead. The well known yet mysteriously secretive Area 51 government and military base is just a short drive from Las Vegas. So what's going on in there? Nobody besides authorised personnel really knows but many believe it's all related to UFOs and the paranormal but it's probably just high-tech development. You won't see much other than sand as the area is off-limits and is heavily guarded. Death Valley's amazing landscapes draw visitors to this unforgiving place despite the 120F temperatures. The Mojave desert is one of the world's most biologically diverse deserts. The 1.6 million acre Preserve is home to Joshua's trees, towering mountain dunes, wildflowers and volcanic cinder cones. With many things to do in Las Vegas you have to go see the Grand Canyon! By car, bus or even better, by helicopter! You've gone all the way to Vegas. How can you miss the Grand Canyon??!! From Las Vegas, the Canyon is about five hour drive and 45 minute helicopter flip. The views in a helicopter are second to none and nothing beats flying inside the Grand Canyon. Gambling is what Las Vegas is renowned for. You won't find it hard to pick a spot to gamble, in fact, they make it easy for you to do so. Try the slots, roulette, blackjack, craps or Texas hold'em poker at any of the casinos on the Strip. Different casinos have different betting limits so it's a good idea to find one that suits your budget and keep the lost wages as low as possible! All the casinos have shops, some more than others and of varying sophistication. The higher-end casinos have boutiques with all the most desirable brand names and haute couture. Take a stroll through the Bellagio, Caesar's Palace and the Venetian for these. Along the Strip you'll be able to find all the Vegas gift shops with plenty of tacky presents for everyone. Vegas is full of happening night clubs playing all your favorite funky beats, so pick up a local "What's On" guide and find the place you want to revel the night away. There are also a few good bars and restaurants along the Strip to be visited and the ever-present souvenir shops feature strongly as well. Las Vegas, being in the desert, has year-round excellent weather. Couple that with the water available from Lake Mead and you have great golf courses for you tee up and improve on your handicap. Casinos have daily shows. Magicians, pop star divas, comedians, boxing events, showgirls, plays and musicals are all featured. You can get tickets for the shows ahead of time online or wait until you are there to see what and who is playing/performing where. Lake Mead and its surroundings are a great setting to enjoy the diverse activities the lake can offer. Boating, water skiing and fishing are just a few you can enjoy on the lake. All the casinos have a variety of eating options with some also having buffets. Needless to say that some of these are hit and miss but they are there for you to chose from should you wish to. All the usual suspects are available but seriously give Fat Burger on the southern side of the Strip a try. They make a great burger. Your favorite American and international beers are all represented in addition to local brews worth a try or two. Saying Las Vegas has a lot of hotel rooms would be an understatement. The city is packed full of hotel rooms with the city heaving with visitors on weekends! Find yourself a great room in a fantastic casino - Las Vegas Hotels. Las Vegas is such a popular destination and there are always lots of deals going around that can meet your budget so do look around a bit. There are a few hostels and cheap accommodation options for budget travelers. Use our hostel booking system to find Las Vegas Hostels. A motel is a good cheaper alternative to a hotel. It's not quite as glamorous but you'll be able to use your savings gambling, eating or partying. There's a few decent motels on Tropicana Avenue not too far off the Strip. Apartments in Las Vegas can help you enjoy all there is to do in Vegas while also having a quiet spot to relax after a busy day. You can try finding Las Vegas apartments. McCarran International airport is a medium sized airport but is, with good reason, a very busy airport. It's about 3 miles from the start of the strip and has all the usual facilities one would expect from an airport. Find out more about Las Vegas McCarran Airport. The traffic along the Strip is crazy but people love to cruise in show off rentals and look at each other stuck in traffic. Once you get off the Strip, the traffic flows nicely with great desert roads that lead to the Hoover Dam and the Grand Canyon. Taxis are a good way to get around Vegas, especially to and from McCarran Airport but they certainly aren't cheap. Expect to wait in line for about 30 minutes to an hour for a cab to take you to town at the airport, especially on weekends. Walking is a great way to take in the sights of the famous Vegas strip. The whole strip is quite a walk and distances between casinos are quite big so nothing is really a short 5 minute walk away. There is a free monorail trail between the Mandalay Bay and Excalibur hotels and casinos stopping en route at the Luxor. The Las Vegas Monorail covers the strip from the north end to the MGM Grand hotel and casino for the price of a ticket. There's a trolley that runs up and down the strip but apparently it's rather slow and time consuming so you'd probably be better off walking. English but Spanish is also widely spoken with croupiers in many casinos coming from a range of countries from around the world also speaking other languages. Las Vegas is in the Pacific Standard time zone which is GMT - 8.